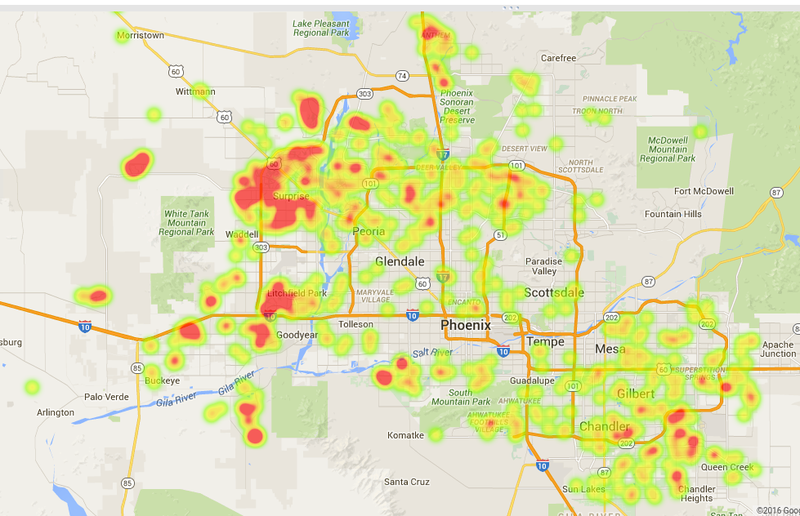 As many know, I have been tracking and mapping solar sales throughout the Phoenix area. Each month I post a “heat map” showing where the concentration of solar home sales are located. Each month, the activity does shift from and to different areas around the Phoenix metropolitan area. Putting my data hat on, I have created a solar home sales heat map for the last 12 months that shows where the solar home sales are concentrated. While it does not say that the less active area have a harder time selling, it does show where solar home sales are more common. As you read my Phoenix area solar home sales data reports each month, it is evident that solar homes sell just as quickly (and many times quicker) than the median and average resale home in Phoenix. The “stigma” that so many people like to report just is not there. I won’t get on my soapbox about how I feel many listing agents are the reason for poor performance or problems during the sale of the solar home rather than solar being a problem for home owners (I have plenty of other blog posts to support that opinion). Take a look at the heat map and look for yourself. Keep in mind that these are verified solar home sales for the last year (April 2015-March 2016) and only include homes that have solar electric systems on the roof (whether solar owned or solar leased systems).